Title of my Labor Day weekend writing start-up. It's NOT a 3 Day Novel Project - somehow, putting in for it seems more stressful that if I hadn't - but the good news is I'm writing something. "That's never a good sign." "What is? You talking to yourself?" ...It'll get more interesting by Chapter Three, I promise. One of the greats of modern American literature passed away this morning. Elmore Leonard, who started off with Westerns moving up to modern-day Crime Thrillers, had been ill for awhile it all finally caught up with him. Hate to say it was the movies that got my attention. His works seem to translate well into film and it was the series of caper flicks post-Tarantino (Hollywood loves to beat a genre to death) - Get Shorty, Jackie Brown (off of Rum Punch), and Out of Sight - that led me to finding his print works on the shelves and diving in. I've got a personal love for Out of Sight, both movie and book, and if anyone says anything bad about either I will hunt you down. In terms of writing, Leonard is one of the go-to mentors who provided a decent list of rules. Never open a book with weather (note: his take that to anyone going with "It was a dark and stormy night"). The Ask A Librarian service in the state of Florida just turned 10 years old this year. You ask, "Gee what is Ask A Librarian" and I tell you it's an online chat service where you login for free, ask a question about a current problem or research itch to resolve, and viola a librarian will magically appear within your computer and grant you three wishes find out the answers to the questions you've got as well as provide citations and links to supporting materials. It's helpful for times that the libraries may be closed: physical libraries can close between 5 pm to 8 pm in the evenings: AAL stays on until 9 pm for general, some universities stay on until 11 pm. Or you may be stuck at home or at work when the question comes to you and you need an answer for it. I know some of you are saying "but gosh, you can just Google it anymore or heck even go to Wikipedia for the answers," and I'll note that's partially true: however, not everything on the Internet is accurate, informed, or itself researched to any degree of academic criteria (ESPECIALLY don't believe anything you read in the Comments section of a blog entry). Wiki may be a decent summation/encyclopedic site, but it's still dependent on editing by persons not always certified or qualified to make the entries you find, and may not go into the detail that some people - especially college students - require. Librarians are providers of information: we are the sorters and sifters and the hunter/gatherers of raw data roaming the information savanna. You might be able to Google, but you may not use the right search terms, or you may go for the first hit that appears without recognizing you're clicking an ad site and not a research site. Librarians know what we're looking for: we ask you the Interview Process to whittle down what you are and aren't looking for in order to a) find the right book, b) find the right link, c) find the right answer. So please, support your library and give the Ask A Librarian service with your local library (it may be under different names, but the service should be the same) a try. One of the biggest decisions in a wanna-be author's life of getting published and read these days is the decision to either go the old route of "get agent, get publisher interest, get reviews" or the newer tech-savvy route of "get self-published, get reviews, maybe get agent and publisher afterward". The old route was tricky, messy, disheartening: getting an agent was one thing, but it was still no guarantee of getting a publisher who would get that book on the market for you. But getting the publisher was a huge boon: the publishers had ties to established reviewers, and publishers had the financial means to market and promote. The new route is satisfying in that you get your book out there right away, on your terms: bad news is, you don't have the financial means of marketing (ad space is costly) and you don't have access to a lot of the major reviewers (some will review self-publishers but they're swamped with thousands of self-published authors already). You're usually reduced to social media like Facebook and Twitter, and most of the time it's just spreading the word to the 80 or so online friends you've already earned. The toughest part is the self-promotion: most writers are artists at heart, and while there's a part of us that's eager to show off, there's the other half that's defensively private about ourselves and our craft. We're not also keen on shilling ourselves: it somehow rubs against our integrity. Advertising always has something... disingenuous about it, like there's too much exaggeration and hyperbole. Just blogging about it here, half the time posting "buy my book!" isn't as eager as it may read: I half-treat it like a joke, with a bit of dread that somehow I'm just not "getting it" in terms of sincerely looking for readership. Writers are an odd lot. A volatile mix of bravado, insecurity, insatiable need, unusual discipline, and occasional talent. Despite that fact that writing itself is a lonely, obsessive, and mentally unstable vocation–just the sort of pursuit that lends itself to anti-social habits and behaviors–authors are likewise expected to be great in front of a crowd, hilarious at the podium, and engaging at the lectern. They are expected to represent the worth of their prose through expressions of personal charm. Which is, of course, completely ludicrous. But since the collapse of publishing (or at least the explosion of dire, whiny articles about the collapse of publishing), publishers themselves no longer spend the requisite money to advertise the existence of all but a handful of titles. For me, the answer is pure communication–an intellectual exchange. Telling a story is the first step. Having that story read and enjoyed and interpreted and understood is the second. Obviously I would like to do so on the largest scale possible. Forget bestsellers and movie rights and relative fame and huge advances (although all those things would be nice in their relative ways), the bottom line is that if I am not communicating with a sizable group of readers, if I am writing in a vacuum for a static body of acquaintances–spending six hours a day in front of a laptop for ten years suddenly seems like a masturbatory and delusional exercise. The great white hope of writing is to reach the point where you no longer have to pimp yourself at all, where you tap into a weird alchemy in which you suddenly have enough name recognition and sales that word-of-mouth and momentum do all the work for you. Then you can sit back and troll Facebook, posting cake recipes and cat pictures and acting like your royalties are preordained and that you are way, way too cool to flog yourself ever again–as if you ever had. Yeah, I want to get there. But mainly because I love writing, I love what I do, and I don’t ever want to go back. That said... Yes, I am STILL working on finishing up my damnable first novel. 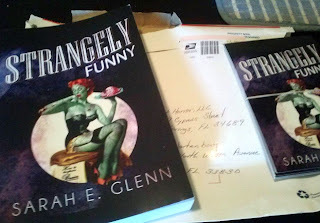 Sarah Glenn, the editor to Strangely Funny, spent time to ask me a few questions about me, my writing process, favorite authors, etc. 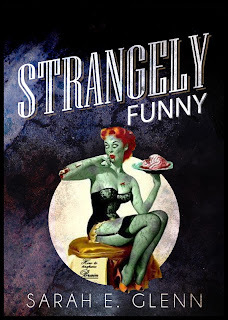 Anywho, check out her blog: she's interviewing all the other authors who committed a story to the humor horror anthology NOW ON SALE! Strangely Funny is Officially Launching! Tell your friends! Wake the neighbors! Feed the kitties! It's LAUNCH PARTY TIME for Sarah Glenn and Gwen Mayo's baby! I'm the second-to-last story in: "I Must Be Your First". Fans of Catriona McPherson, David Perlmutter, Suzanne Robb, Rosalind Barden, and Jon Michael Kelley (with a ton of other authors) should take a look-see as well.